Add all other ingredients into a bowl and mix together, Choc chips last. Combine all Sauce ingredients in a small sauce pan on low heat. Stirring until all ingredients are liquid and mixed together. 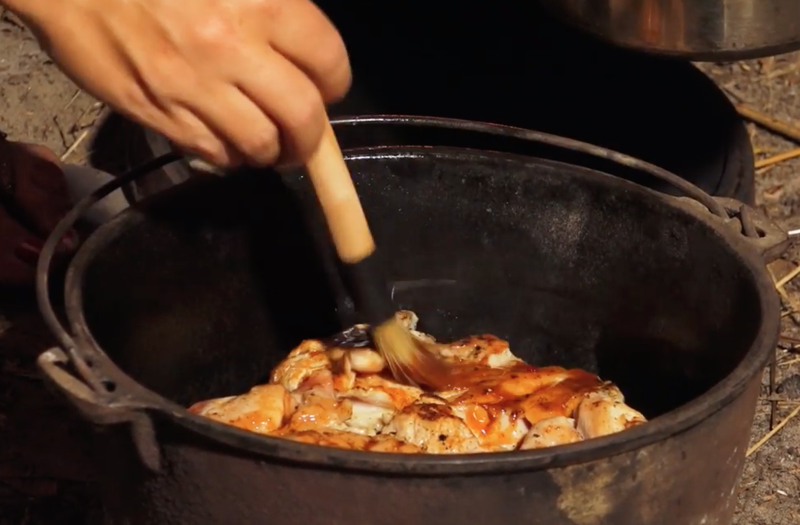 Heat tablespoon of oil in frypan and brown chicken thighs. Season with salt and pepper (use cayenne pepper for extra heat) Complete in batches and put aside in a bowl. Oil camp oven and place wire skillet rake in base of camp oven. Place chicken on top of rack and baste with sauce. 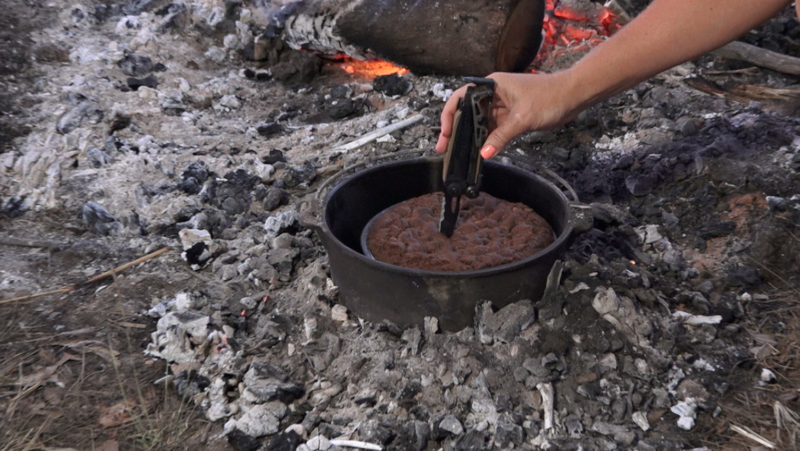 Place camp oven on a bed of coals and add coals to the lid of oven. Cook for approx. 10 minutes and remove from fire. Turn chicken over and repeat basting sauce, covering chicken with a generous amount of sauce. Cook for approx. 10 minutes. Checking at intervals to ensure camp oven is not burning the chicken. Heat tablespoon of oil in frypan and brown floured steak cubes. Complete in batches and put aside in a bowl. In the same frypan, brown Onion and bacon. Heat Camp oven to Moderate heat and add the browned beef, bacon & onion, Tomatoes, Potatoes, Corn, peas, beef stock & water and Port. Place camp oven on a bed of coals and add coals to the lid of oven. Cook for approximately 1 1/2 hours. Checking every half an hour. How to Use a Winch. Pre Cooked Meals for Your Big Trip. * Add oil, onion, and capsicum to heated camp oven. * Add diced chicken and allow to brown. * Add 1/2 jar of Red Curry Paste, and fish oil. Stir through. * Add shredded Kaffir lime leaves, diced Lemon Grass, and mushrooms to pot. * Finally add 1x whole tin of Coconut Cream, bamboo shoots, and Raw Sugar to taste. * Place lid on pot and allow to boil till chicken has cooked through, stir occasionally. * Whilst Chicken is cooking, boil rice in water with a touch of salt added. 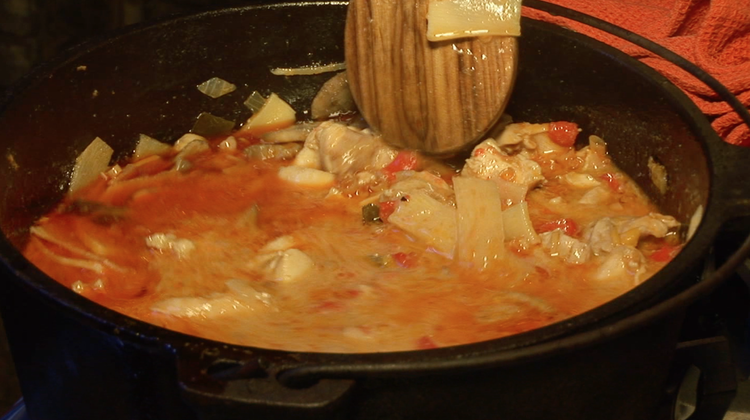 * Once Rice & Chicken is cooked, dish curry over a bed of rice and serve. 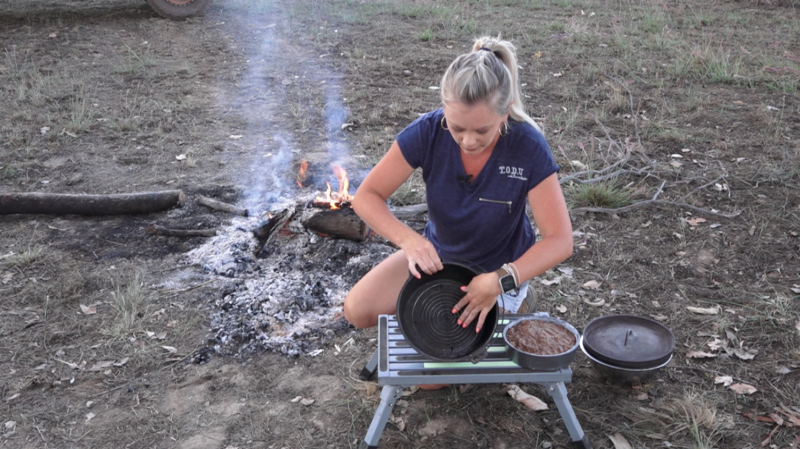 A great dish for cold nights in the bush! * Add dash of Sesame Oil and Garlic to heated Camp Oven. * Once meat is brown add Oyster Sauce to pot. Stir ingredients thoroughly. * Serve up with a fresh salad of lettuce, tomato & cheese. A tasty light dinner that never seems to have any left over! Using a thick heavy based pan, fry the paste in macadamia oil for 20 to 25 minutes, stirring all the time. The paste will change colour to a deep yellowish red. If the paste starts sticking to the pan just add a little water as you go. Next add the sauce ingredients with 1 cup of water to ensure the consistency of the sauce is like a broth. Bring to a boil and turn heat down and simmer for 5 mins. When cooked adjust the seasoning to balance the flavours. For example more fish sauce will make it more salty and coconut palm sugar adds sweetness. Gradually add lime juice to taste for acidity but not too much. These flavours should not dominate and balance should be present. At this stage you are almost ready to serve your meal so ensure the table is set and the brown rice is hot. Start by putting the flathead and prawns into the broth. Now dish up the beautiful aromatic curry in individual bowls and let the guest help themselves to the rest. We like to serve with steamed brown rice and greens. Garnishes of healthy organic sprouts, radishes and macadamia nuts add texture to this healthy meal. Pound all ingredients together in the pestle and mortar until you have achieved a nice refined paste. Note: this paste will freeze well in small containers. Pen’s Tip: If you make your curry paste from scratch, once you've made it chuck it into some ice cubes, freeze it and then pop them into some snap-lock bags and chuck it in the fridge in your car and you can simply use them while you're out camping instead of the store bought curry paste if you want to.